Now into its eighteenth year, the Etape du Tour has established itself as the flagship event in the European sportive calendar, annually producing a gruelling Tour de France mountain stage for amateurs to pit themselves against. This time round is no different, with the 2010 event promising to be a cracker. Celebrating the hundredth anniversary of the Pyrenees’s inclusion in the Tour, the 174-kilometre route takes in the tough climbs of the Marie-Blanque and Soulor before a showpiece summit finish on the Tourmalet, the highest road pass in the central Pyrenees. Just two days after the 2010 Tour de France route announcement, CW got on the road in Pau to check out the gruelling parcours. The expansive Place Verdun felt a lot larger for CW in the dawn October chill than it will for the 9,500 riders rolling out of it this summer. The route quickly heads south onto the poplar-lined Route National, bound for Oloron-Sainte-Marie. Our correspondent opted for the safety of the car on this stretch, rather than risk running the gauntlet among the HGVs. However, for the adrenalin-filled Etape peloton, these first 45 kilometres on dual carriageway promise to be the fastest of the day. A couple of stiff climbs on the dual carriageway will get the heart pumping. The route stays on the fast main road till turning off at Escot, at the foot of the Marie-Blanque. After heading through the village, the right turn onto the day’s first climb is a 90-degree right-hander, so bottlenecks in the bunch are possible. With two tough climbs to come, pacing yourself in the first couple of hours is crucial. This particularly applies to the Etape’s opening climb, as its fluctuating gradients making it difficult to find a rhythm. After the summit, where the Etape’s first feed stop is rumoured to be, there is a brief section of false flat before a generally quick and safe ten-kilometre dash into the valley at Bielle. Watch out for one or two sharp bends, as well as a couple of minor cattle grids halfway down – they’re called barrières canadiennes. Though a mere pimple on the route profile, a punchy two-kilometre climb out of Louvie-Juzon, came as a shock to the system after the headlong descent. A fourth-category climb in the Tour de France in the past, this ascent was steep enough to hurt the legs and require the small ring. From there, it’s a rolling ride on winding roads through sleepy towns in the Pyrenean foothills. The road starts to slowly rise again at Asson, where the route dives right and heads for the start of the Soulor at Ferrières. As you cross the 100-kilometre mark, mountains loom menacingly on the horizon, a sign of things to come. The Etape du Tour is gruelling enough without treating the event as a 100-mile mountain time trial. To achieve the best time, it is sensible to get into groups on the long valley and downhill sections in between the climbs. Any energy saved will get you up the Tourmalet that little bit faster. For example, between Bielle and Ferrières, there are 40-odd rolling kilometres that can be covered faster when sharing the workload. The Soulor doesn’t mess about, the road quickly pitching up to seven percent and staying around there for the duration of the climb. Its difficulty ensures that it is a more-than-worthy precursor to the Etape’s centrepiece final climb. From the top, it’s an exhilarating first half of the descent. With several sharp turns, this is where a fluid and confident descender can put time into a more timid counterpart. The stage profile may give the impression of a continuous descent for 20 kilometres, but CW found that a false-flat headwind section through Aucun sapped precious energy before the road dives down again for a 60km/h burn-up into tourist-friendly Argelès-Gazost. From here, it’s a long way up to the Tourmalet’s lofty summit – about 1,600 vertical metres. The climbing begins on the outskirts of the town, the best part of 35 kilometres from the finish of the Etape. The scenery on the slowly-rising corniche road, hewn into the rock-face, is stunning, with the eye-catching Gorges de Luz on the other side. CW enjoyed a blessed tailwind for some of the way, but generous gusts could not disguise the road steeping into five and six percent straight stretches for several kilometres before Luz Saint-Sauveur. The town is likely to be the home of the third feed stop; there is also a water fountain in the main square to fill up your bottles. The Hors-category Tourmalet comes as a daunting prospect after six hours of tough riding. 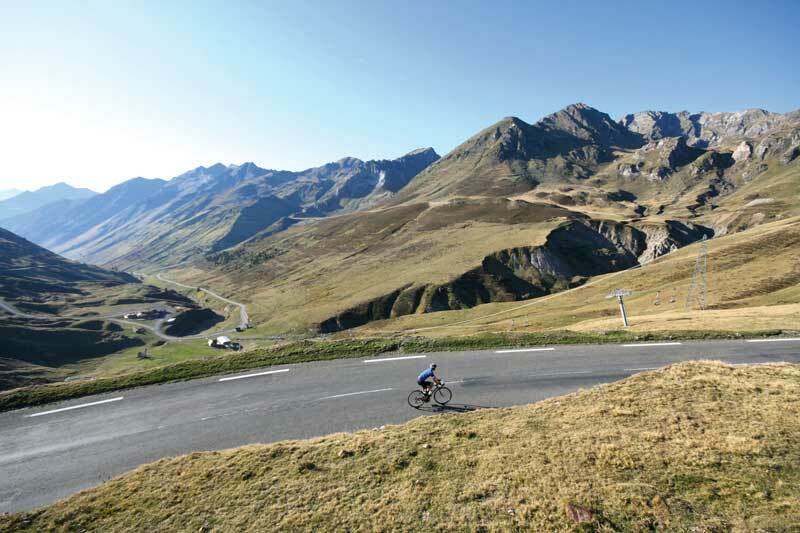 Abnormally long for a Pyrenean climb, its unwavering gradient and mentally draining straight sections will ensure that the legendary climb delivers a stern test to even the hardiest of Etape competitors. Average gradient means nothing, folks. The Marie-Blanque hits practically every gradient in the book, its constantly changing pitch coming as a nasty surprise after the opening 40 kilometres of flattish riding. After a benign start, the climb suddenly kicked up to ten percent, forcing me into heavy breathing and my lowest gears. Settling down again for the middle section, the bottom half of the Marie-Blanque is well-shaded, providing ample protection from the sun. The scenery is much akin to common Surrey Hills fare. However, after passing a faded blue milestone, the diabolical gradients – the steepest of the day – rear their ugly heads in the final four kilometres. Even worse, the road stays largely straight for much of the climb’s final third, making it go on for what feels like an age. The closing nine, twelve and thirteen per cent ramps felt like some of the slowest kilometres I’ve ever ridden. To boot, trees hide the summit until the final 100 metres. Coming so early in the day, I was perhaps a little too relieved to reach the top. The climb isn’t used often from its north side in the Tour de France. The draggy roads leading up to the town of Ferrières already took me up to 500m. Narrow and wooded, deep in the Ouzom valley, they lent to a feeling of quiet isolation. Sheltered by the dense woodland, the climb’s opening kilometres ease you into things, at a steady six-percent. At the five-kilometre mark in Arbeost, things set serious. From here to the top, the gradient barely fluctuates, averaging eight percent. Though steep, I found the unchanging gradient made it easier to get into a rhythm and tap out a solid – albeit slow – pace. The second half of the ascent is more exposed to the sunlight. As for most of the day, there are fine mountain vistas to be enjoyed as you climb higher: the tinkle of cowbells and stretching green pastures could easily be mistaken for a Swiss Alpine scene. The Soulor was comfortable if tough, sapping valuable energy and resolve. For me, there was a kind of impatience associated with it – I just wanted to get it out of the way so I could focus on the Tourmalet. After the opening three kilometres out of Luz-Saint-Sauvuer, it is an unrelentingly long and steep haul to the top of the Tourmalet, the gradient barely wavering between seven and nine per cent for the duration. Predictably, I had overdone things earlier in the day and subsequently found the Tourmalet very tough. I broke the climb into three manageable sections: from Luz-Saint-Sauveur to the ski resort at Barèges (11km); Barèges to the five kilometres to go mark where the climb’s summit can first be glimpsed; then the final push to the top. The rigours of the day began to catch up with me in the climb’s opening kilometres: neck-ache, back-ache and a searing pain in my calves. However, the repetitive mental strain was the most damaging ailment. Psychologically, this climb is very tough to handle. At least the Etape riders will be going through the same, slow torture as thousands of others on the slopes; on this unexpectedly-warm October day, a feeling of loneliness pervaded for me, from the steep road seemingly stretching into the horizon to the empty chair-lifts. Moreover, after Barèges at halfway, there is precious little civilisation. Dredging up the remnants of my energy and confidence, I pushed on. The views get more impressive higher up, but I barely noticed amid the strain to reach the top. The final kilometre, a metaphorical raspberry-blown-in-the-face, seemed interminable, ramping up to 10 per cent. The huge relief at reaching the top, after two hours of plodding progress, underlined how much the Tourmalet made me suffer. Andy feeling proud of himself at the top of the Tourmalet. And yes, we’ve told him about his ankle warmers. Sign up for the Etape now!